Gnat Attack in Mario Paint. Gnat Attack is a minigame originally found in Mario Paint, in which the player must swat different fly-like enemies using a flyswatter. 1.2 WarioWare, Inc.: Mega Microgame$! In Mario Paint, the player controls a gloved hand (similar to the one seen on the title screen) holding a flyswatter using the SNES Mouse, which must swat flying insects on the screen, before the insect stings the player's hand in one way or another. There are three levels, each with 100 insects; after defeating them, the boss, Watinga, appears. Completing stages causes Mario characters to walk across the screen. When the player defeats the last boss, it takes them back to level one and adds a small icon in the top left corner of the screen; there is no final level or reward, as the game will loop endlessly, getting slightly harder each time. 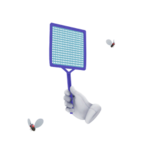 Gnat Attack was modified into both a microgame and a bonus minigame in WarioWare, Inc.: Mega Microgame$!, under the names Mario Paint: Fly Swatter and plain Fly Swatter, respectively. The microgame involved shooting the flies as they flew past a fixed target, while the minigame was more faithful to Gnat Attack's gameplay. Gnat Attack in Super Mario Maker. Gnat Attack makes a return in Super Mario Maker. The minigame is triggered when the player taps and kills all three flies that appear during the editing mode at one particular time. The flies appear either after waiting 15 minutes while leaving the game idle, moving a block, or shaking a Muncher several times; the second method only works at random, and the third is the fastest in terms of effectiveness. Swatting all three flies using the touchscreen will trigger the minigame. It is split into three stages, with Watinga appearing in the third stage, like in Mario Paint; each stage is completed once all of the flies in it are swatted, like in the SNES version. Since the game now uses the stylus in place of a mouse, there is no mouse cursor and therefore no need for health; instead, each stage is given a 30-second time limit. The Builder Mario costume for Costume Mario is unlocked upon beating the third stage of this game for the first time. Upon losing any stage or winning the third, the player is given an option to restart at Level 1 or quit to the editor; the game can also be exited early by pausing and touching the can of insect repellent. The 1.20 update for Super Mario Maker released on November 4, 2015 adds a more challenging version of Gnat Attack with a pink background. It is accessible by shaking a Muncher until Watinga spawns, then swatting Watinga several times. Completing this mode will unlock the Fighter Fly costume for Costume Mario. Gnat Attack does not appear in the Nintendo 3DS version, Super Mario Maker for Nintendo 3DS. Artwork of the Flies & Hand Assist Trophy. The minigame appears as an Assist Trophy in Super Smash Bros. Ultimate, under the name Flies & Hand. The flyswatter will hurt any enemies that make contact with it trying to hit the flies. Gnat Flies across screen; cannot harm Mario. Big Fly Can fire projectiles. First enemy that can harm Mario. Dragonfly Fires projectiles. Very aggressive; goes after Mario. In Super Mario Maker, they appear in the second stage and fire Mini-Gnats if they are not swatted quickly. Bomb Fly Explodes when hit or when left alone. Explosion can harm Mario. In Super Mario Maker, they appear during the third stage (and every stage in hard mode, and in horde) and one second is lost if they explode. Watinga The minigame's boss. Fires projectiles at Mario. Takes 20 hits to kill. In Super Mario Maker, he can fire Gnats and vanishes until all the Gnats are swatted. This page was last edited on December 26, 2018, at 01:32.